Taste test: It was easy to tell that these were kettle-cooked chips, because the potato flavor dominated more than any of the powder that they put on the chips. 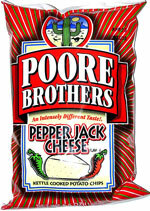 We had to try several chips before we could tell that we were eating a cheese-flavored chip, much less a pepper jack chip. Even licking the chip didn't really give us the taste of pepper jack that we were looking for. The chips had a slightly spicy aftertaste, but it wasn't really hot enough that you would need a glass of water, and the heat arrived well after the chip had been swallowed. I was kind of disappointed in the overall chip, although the kettle-cooked style did give it a nice crunch. Smell test: Smells a little like jalapeno chips. 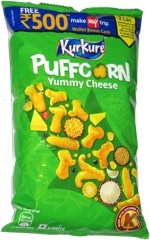 This snack was discovered by Keith at Safeway grocery store, Scottsdale, Arizona. Review published .